Hello, I need to change the name of the port SNMP String. What is the command to change this string for example "Stack Port 1: 1" to "tester"
Hi Rodrigo, you can use the command "configure ports 1:3 description-string tester" to change the SNMP string. Hi Tyler, tks for reply , but the comand "configure ports 1:3 description-string " does not exist. can be known whether any other ? Display-string has a maximum length of 20 characters and does nos accept spaces. Description-string has a maximum length of 255 characters and accepts spaces. Show port info will display the display-string. Description String: "This Is The Port Description String"
Whatever you write in the MIB variable ifAlias (1.3.6.1.2.1.31.1.1.1.18) will show both in Description String and in Display String (truncated to 20 chars). checking the Mib really exists ifAlias. I used the ifAlias in Zabbix graphs and showed the name I needed. Can you please tell me how do you change use ifAlias . 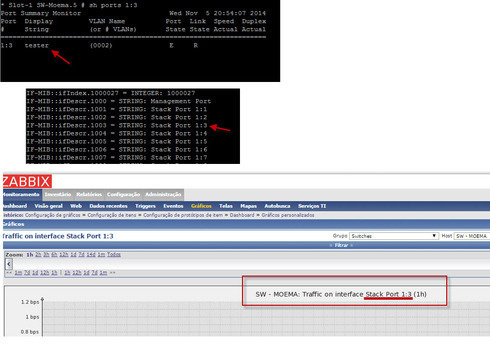 Currently i am also trying to see Port Description in SNMP sever side. When port up down happen snmp traps send to the server then send to Administrator for alert messages via email. Currently can only see .1013 mean 10 switch 1 port number 13 up down etc. can't see the port description. Appreciate your help! Thanks.